How do I light up my home in such a way that does not overwhelm but soothe our eyes and minds? In the absence of natural light, how do I ensure that every corner of my room stays lit without racking up huge bills? The light of my home office is very bright, I cannot seem to read or work long enough without hurting my eyes. I am sure, almost every householder finds himself or herself occupied with these nagging problems every now and then. Not that we have done away with the candles, lanterns, oil powered earthen lamps or torches even if for decorative purposes. But those are no longer our primary sources of light after the evening sets in. Newer technological advancements are arming us up with latest lighting products every day. Each one of them is boasting of various advantages over the others, opening up greater sources of confusions. It is an interesting conundrum and a realisation that increased availability of choices does not always make our lives easier. That said, choosing the right type of lighting products for the different rooms of your houses does not need to be so difficult either. Today we will try to clarify whatever residual doubts you have on the topic. It is best to plan for interior lighting right at the beginning when you are thinking of decorating or refurbishing your home. Do not ignore the necessity of having large windows for any of the rooms that let sufficient amount of light in. Natural light has obvious health benefits, augments the beauty of your room the natural way and helps saving on the electricity bills during daytime. Depending upon the size you may require a combination of spotlights, accent lights and table lamp to brighten up your room the proper way. Valance lighting helps to bounce light off the ceiling and spread a cheery note in the entire room. Paint your ceilings white or coat it with a lighter shade to make this work more effectively, especially if you have a smaller living room. 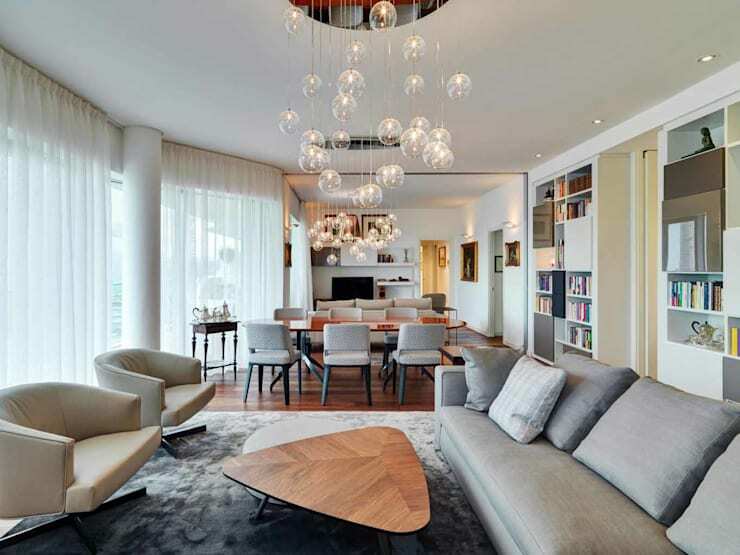 For decorative purposes a chandelier or pendant lighting like this living room designed by Studio Marco Piva will be a great addition. If you regularly read to sleep then wall mounted and adjustable light fixtures will work best for you. Floor lamps with adjustable arms look sleek in a contemporary setting. Traditional table lamps too can be used for the same purpose. It has an unbeatable decorative presence too and can easily be upgraded any time. Having dimmers in bedroom will ensure you can create a relaxing ambience at will. Ceiling mounted lighting fixtures are best for closet that share the space with other bedroom furniture. Wall mounted lighting on top of the mirror is a must have for any bathroom. You may consider having ceiling mounted ones as well if you have traditionally decorated bathrooms. large mirrors set on the walls which help bouncing off the lights in all directions. A wall scone on the opposing wall will help reflect light the proper way and keep your bathroom comfortably lit. 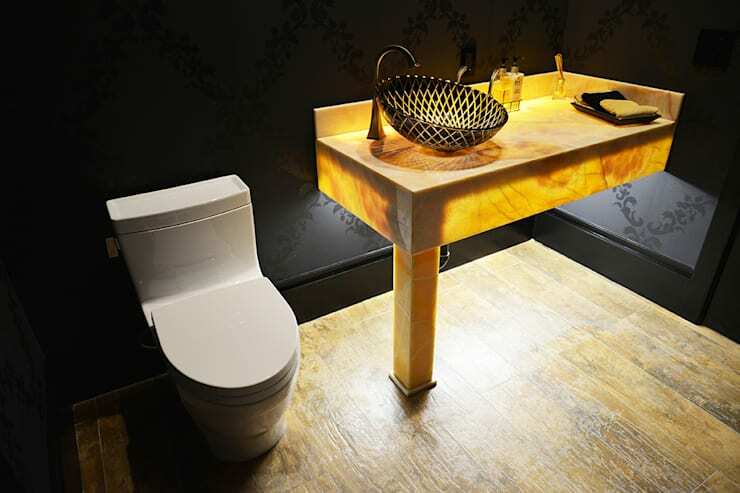 This toilet designed by Erika Winters Inc employed a rather interesting mean to light up the space. The slightly begrimed and back lit onyx table does the trick here. However, you will have to complement it with task lighting for the purposes of personal grooming. 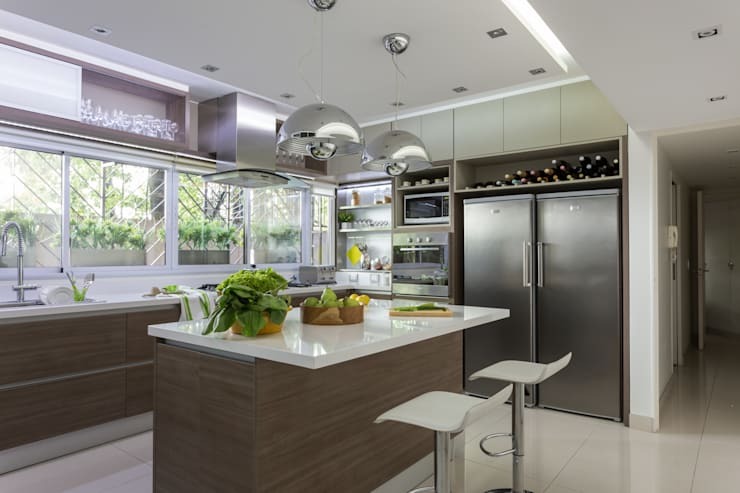 Modern kitchen can best be served with a combination of ambient and task lighting. If you have cabinets mounted over your kitchen countertop then having under cabinet fixtures would be good idea. This will prevent the formation of shadows while you are busy cooking up delicious meals for yourself and your family members. Presence of soffit and pendant lighting will have useful effects on areas near the kitchen sink and island. Pendant lighting will also be a nice embellishment for a place where you spend a good portion of a day. A dining room must have a fine chandelier or pendant lighting suitable to the style of the room with a focus right on the dining table. After all, it is there where the entire buzz will be. For other parts of the room ceiling mounted spot lights or cove lighting would work fine. 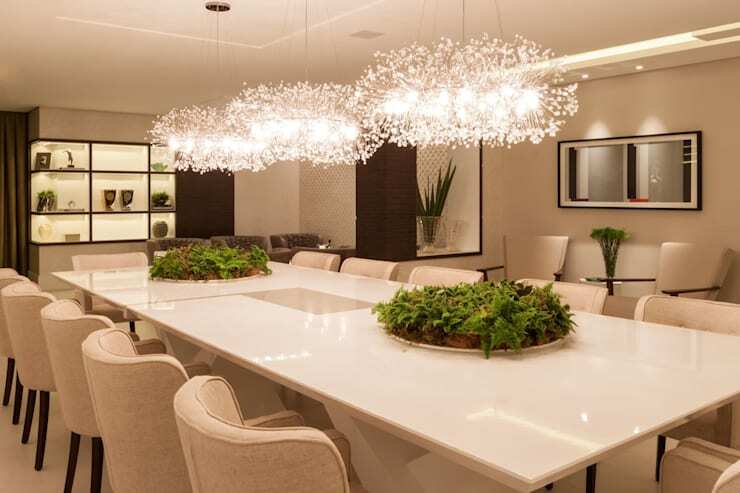 Chandelier with dimmers will help introduce a mellow mood when intended. A pair of traditional table lamps or wall scones on or near the sideboard or console table will make your room look regal. Remember, if your dining room wears dark shades then you will have arrange for brighter lights. It is better to set your study table in front of or near the window if you can afford to. Though this does not mean you will not have to invest in proper lighting for your study or home office space. Wall scones can work for a small room, but make sure that the light does not reflect on your computer screen. 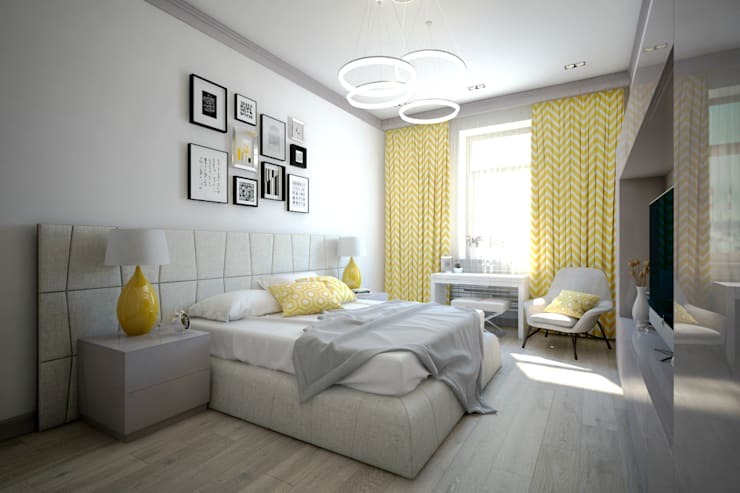 Adjustable floor light or wall mounted light with adaptable arms can also be a solution for this type of a room. Cove lighting will work best for a bigger space. 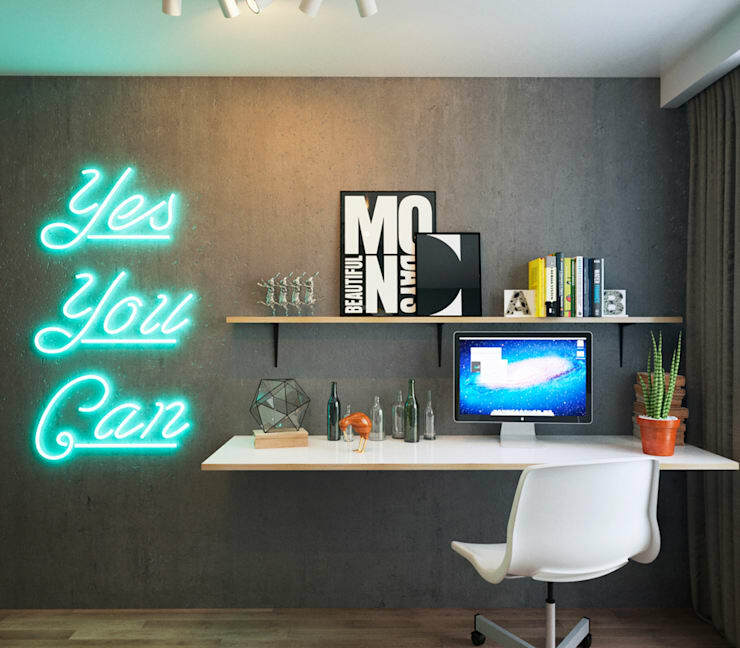 A neon sign like the one shown on the image serves more than a decorative purpose. Have a look here to find out how modern apartments are using latest technology to light up their rooms the proper way.